The Irish Independent Sportstar awards are just one day away and we are delighted to announce the winners of our great prizes. Almost 20,000 sports fans cast their vote to decide our 2018 Sportstar of the Year, Young Sportstar of the Year, Team of the Year and Magic Moment of the Year. 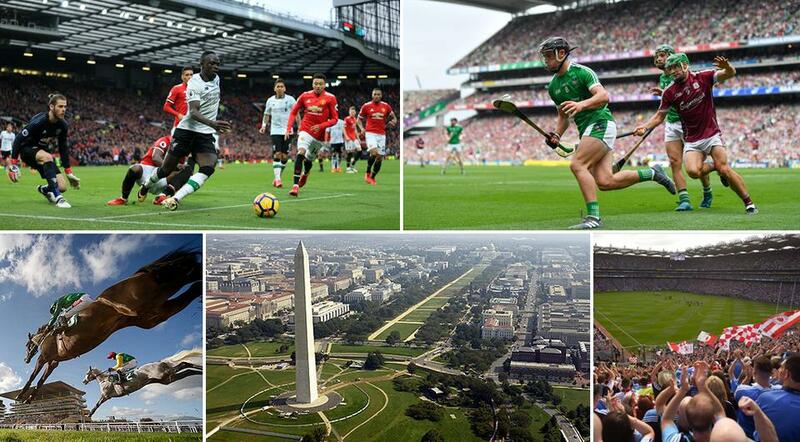 From tickets to Man United vs Liverpool to a trip to Washington, D.C, there were some great prizes on offer this year. Dan Mc Swiney, Cork won the trip for two to Old Trafford to watch Manchester United v Liverpool in February 2019. Conor Sheeran, Dublin won a VIP Hospitality trip for 4 to the Cheltenham Festival in March, 2019 to include flights..
Daryl McMenamin UK, won the trip home to Ireland to attend the awards. Michael	O’Keeffe, Kerry won two tickets to the All-Ireland football final plus an overnight stay at The Croke Park Hotel on the night of the match. Paddy Shore, Waterford won two tickets to the All-Ireland hurling final plus an overnight stay at The Croke Park Hotel on the night of the match. Orla	Murphy, Cork won two premium tickets to the All-Ireland camogie final plus an overnight stay at The Croke Park Hotel on the night prior to the match. Maria	Walsh, Dublin won two premium tickets to the All-Ireland ladies football final plus an overnight stay at The Croke Park Hotel on the night prior to the match. Shay	Keevans, Waterford won two tickets to the Irish Independent Sportstar of the year awards, with an overnight stay in the Croke Park Hotel. Padraig	O'Connor, Co Mayo won two tickets to Ireland's 2019 Six Nations home games in the Aviva Stadium, Ireland v England, Saturday February 2 & Ireland v France, Sunday March 10. Ciaran Lee, Kildare won a dream trip for two to Washington DC, with flights compliments of Aer Lingus and accommodation for four nights in The Dupont Circle courtesy of The Doyle Collection. Charlie	McGrath, Galway won a weekend for two in a Doyle Collection hotel in London, with return flights to London (flying into either London Heathrow, London City or London Gatwick) compliments of Aer Lingus. Patrick	Morrissey, Limerick won a VIP day at the 2019 Galway Races Summer Festival on the opening day of their 150th event Monday 29th July with over night accommodation with breakfast for 2 guests sharing on Monday 29th July at the Connacht Hotel. Lorraine Manning, Dublin won a trip for two to The River Lee Doyle Collection hotel in Cork.